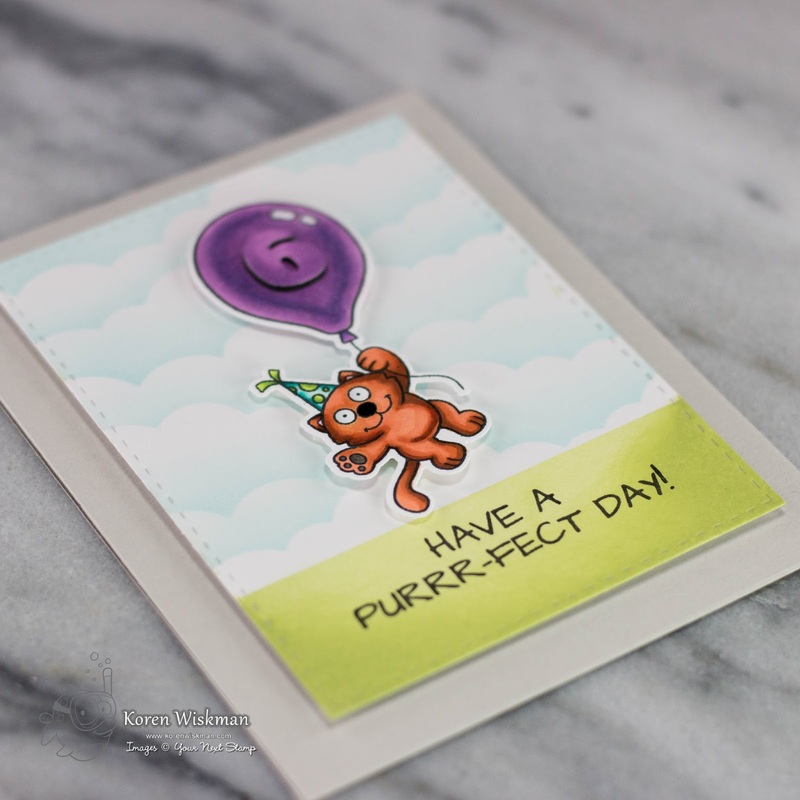 Today I am sharing with you my project for Your Next Stamp August Preview Day. This is a very special release for Your Next Stamp. Your Next Stamp is celebrating it's 8th Birthday this month. This release is full of birthday stamp sets that will be sure to catch your eye. 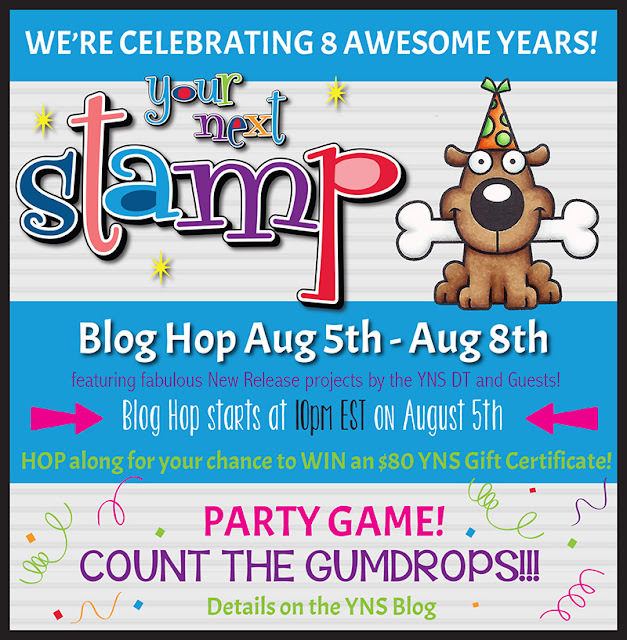 Once the new release goes live on the Your Next Stamp online store... (CLICK HERE)... to find all the new products. Until then, visit the Your Next Stamp Blog to see all of the new release preview designs the team has to showcase... (CLICK HERE). Today I am using Party Pets, one of my favorites of the whole release. I started by creating my background with the mini cloud stencil by My Favorite Things. I sponged the clouds using Versamagic chalk ink in Sea Breeze on Strathmore Bristol Smooth White cardstock. I then used the same type of ink in key lime and tea leaves to create my ground. I cut out my background panel using the second largest die in the Your Next Stamp stitched rectangles die set. The sentiment was stamped in the bottom center using Versafine Onyx Black ink. My image was stamped in Memento Tuxedo Black ink on Neenah 80lb cardstock. I used my Copic markers to color in my image. 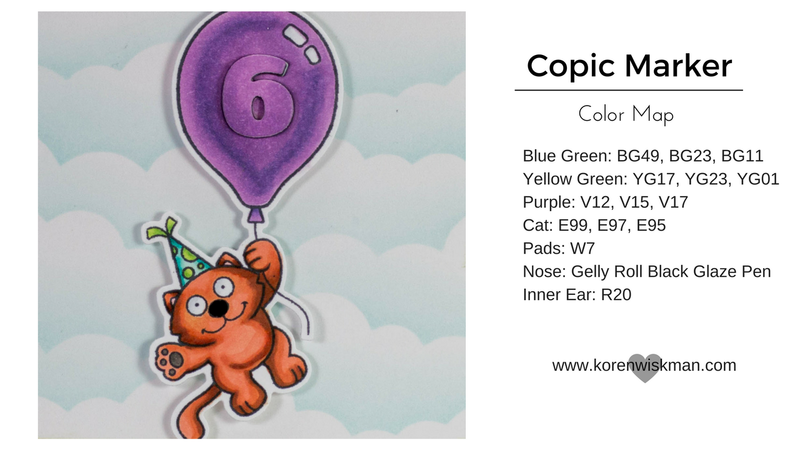 A Copic color map of the markers I used is added below in this blog post so that you can have a list of all the colors I used. After my image was colored, I used the brand new Bold Alpha numbers die set to personalize my card, using an inlaid die technique. I cut the number six into the balloon and popped it up using the same die cut out of black craft foam. The image was then placed on the background with foam tape to give it even more dimension. The entire front panel was placed on a Simon Says Stamp Fog top folding A2 card base. For photos of my card, a link to my YouTube Video creating this card, a Copic color map of this image, and a supplies list complete with link to the products I used to make this card, look below. Super cute Koren! I love how you put the number on the balloon. Smartie! Your card is adorable!! happy birthday your next stamp!! That's gorgeous! Love the cloud background!! Adorable. The number looks so cool. Your Garfield is adorable !!!! !